When setting up an entry you need to decide which types of tickets will be available to your customers. Tickets are created in the Tickets & costs section when creating or editing an entry. Before you get started on creating tickets you should consider defining the Maximum event size. This is the maximum number of people who can attend an event and will place an upper limit on the amount of tickets that can be sold (including multiple attendances on group tickets). If there is no upper limit on your event you may leave this field blank. Ticket name - This will appear on your schedule for customers to select, it should describe the type of ticket you are creating. Additional information - You can type a description of the ticket here, this is recommended if you are creating a special ticket type. E.g.- "Group booking special for up to 8 people". Or if you have a block booking discount offer "Buy 5 tickets and get 20% off!" Cost of booking - This is the value of the ticket and should be set to the total you expect your customer to pay for your event and the amount (including payment gateway fees) that you expect to receive. Number of tickets available - This defines the amount of this ticket type that will be available for each date of the event in your entry. This should take into consideration the maximum event size. For example, if your event is limited to 17 people you can only sell 3 x 5 people group tickets. Restrict when this ticket will be available - Primarily used to create an early bird ticket (or advance ticket). Checking this box allows you to specify when the ticket will be available for purchase and when it will close (no longer be available). 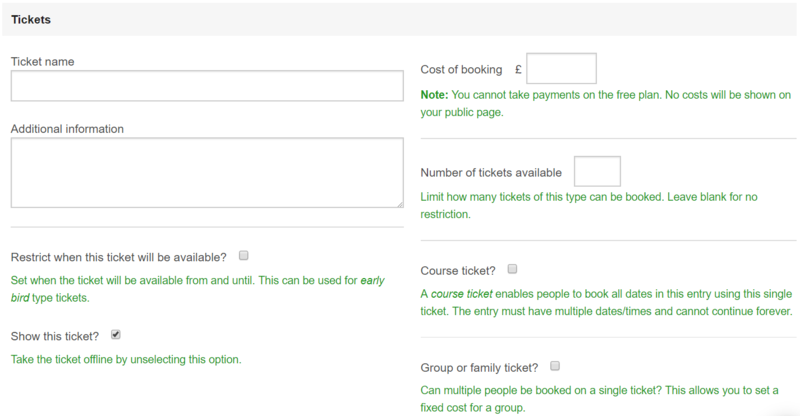 Course ticket - Select this option if the ticket is designed to allow customers to attend every date on the entry. Group or family ticket - Select this option to create a group ticket and set a fixed cost for multiple people booked on the same ticket. Specify the minimum and maximum number of people that the ticket can cover and make sure you have priced accordingly in the cost of booking. If a payment is required you can select how you would like to receive it from your customer here. Enforce online payment - your customer must pay for their ticket before completing checkout, payment will be take through your chosen payment gateway. Online/ offline choice - your customer may choose between an online or offline payment. Offline only - Your customer is asked to check a payment to acknowledge ‘I agree to pay later’ and payments are taken outside of Bookwhen by yourself. More information here. Once this is done you may need to record payment against the Bookwhen booking reference. You can determine the Maximum tickets per booking to limit the amount of tickets a customer can book in a single transaction. For instance, if customers are only allowed to book tickets for 1 attendee per booking you may set this field to ‘1’.